Impact Factory has been in operation since 1991, providing tailored Professional Personal Development programmes for the private and public sectors as well as a comprehensive series of Open Courses. In that time we have run training programmes for well over 100,000 delegates. There are many excellent trainers in the UK; no longer is the norm endless PowerPoint, note-taking, chalk ‘n’ talk style ‘teaching’. Far more trainers are opting for the experiential approach and thank goodness for that. People learn best within an environment that’s stimulating, fun, engaging and interactive, which is why in order to become an Impact Factory Accredited Trainer our colleagues have to be versed in a huge range of skills, talents and creative capabilities. Impact Factory doesn’t hire training deliverers. We develop dynamic, vibrant, highly creative people who are involved in all aspects of our work. In order to achieve that our people have to undergo a rigorous Two Year Training Programme in order to be fully accredited by the two founding Directors Robin Chandler and Jo Ellen Grzyb. No trainer, however skilled, can just walk into Impact Factory, grab a programme, get a bit of tutorial and set off to work with our clients. 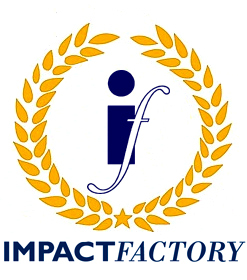 We have very clear criteria that people need to fulfil to be able to join Impact Factory’s programme in the first place; they are based on the skills and abilities of the two Founding Directors and are: a psychotherapy or counselling background, a drama based background, an experience of group dynamics and an understanding of the business world. We also tend to accept people who have had a goodly chunk of life under their belts so they bring depth and a range of experiences to the training room. Trainees attend weekly internal training sessions, attend Open Courses as delegates to experience the work first hand and receive reviews on a continual basis. As they progress within the organisation they attend client meetings, write proposals and create training programmes as well as deliver training. Their development is reviewed during monthly meetings held by the Directors and senior trainers. In addition, after every course the two trainers have a debrief and give each other feedback, which is written and is part of our on-going appraisal process. In addition, the Directors accredit each Open Course by attending every programme once a year to ensure quality and freshness.